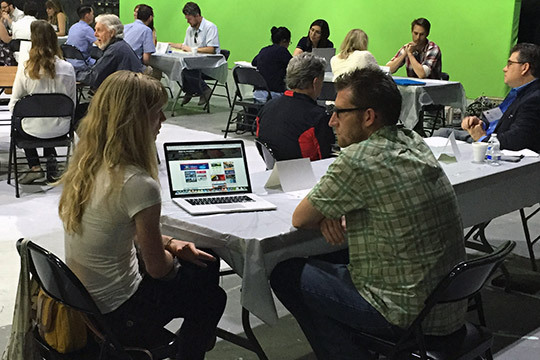 This past weekend, Jacob and Oniracom collaborated with AIGA Santa Barbara’s for its 7th annual Portfolio Day. One of 70 chapters nationwide, AIGA Santa Barbara is the professional association for design. It’s annual Portfolio Day “offers students and emerging designers the opportunity to connect with working creative professionals, get feedback on their work, and gain insights in finding and keeping a job in the industry.” As one of 24 reviewers, Jacob contributed his expertise to three 30-minute discussion/feedback sessions, and a roundtable session, with students from across the 805. In Jacob’s own words, “It’s always a welcome experience feeding off the energy in a room full of creatives. AIGA’s Portfolio Day is a perfect breeding ground of eager presenters and seasoned reviewers, connecting individually or in small groups I enjoyed meeting the designers and wish them all success in their endeavors!” You can read more about this year’s Portfolio Day on the Solutions for Dreamers blog.